this is the beginning of a long happy relationship! We strive to provide the best veterinary care for all types of small animals including birds, cats, dogs, and exotic pets. Our services include primary medical care, vaccinations, laboratory testing, X-ray, surgery and dentistry. We have a complete pharmacy and offer a full line of Hills Prescription Diets, Science Diets, and flea control products. Boarding and bathing are also available for your pets. Doctors Sands and Gustaevel are graduates of the Ohio State College of Veterinary Medicine. Doctor Manz is a graduate of the University of Pennsylvania.The Akron area is rich in specialists and consultation with these professionals is also available. 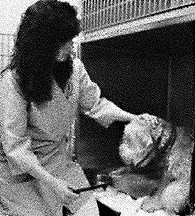 Our Veterinary technicians are professionally trained and registered with the state of Ohio. 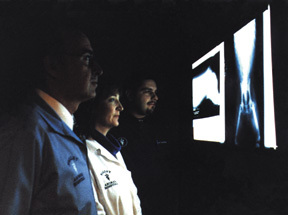 They assist the doctors, conduct laboratory tests, and are qualified to manage many procedures independently. Their expert nursing care is a vital part of our practice. Because we recieve many calls every day, it is not possible for the doctor to answer each call personally. Our office staff is qualified to answer each call personally. Our office staff is qualified to answer many of your questions, relay your concerns to the doctor and get back to you with specific instructions or advice. When laboratory tests or specific procedures are necessitated, the doctors will discuss the results with you personally. The best medical care cannot be given over the phone, so we ask you to accept our judgement regarding the need to be seen in the office. Fees for services are payable at the time they are rendered. It is customary to charge an emergency fee for after hours visits. The Valley Animal Hospital reserves the right to require a deposit on any and all procedures. We accept cash, checks, Visa, MasterCard and Discover for your convenience. Our boarding kennel provides a clean, comfortable environment for our guests. The dogs are walked three times daily in a fenced yard. The doctors check on our boarders regularly and veterinary care can be provided during a visit. Admission and release are provided only during regular hospital hours. Visitors are welcome from 10:00 AM - 5:00 PM, Monday thru Friday. ©1997-2002 The Pets Pajamas, Inc.
Valley Animal Hospital and the Valley Animal Hospital logo are TradeMarks of Valley Animal Hospital.